For many of us, the dog-days of summer are here, with warmer temps and maybe extra humidity. But wherever we are, and whatever the weather, delicious, satisfying, and extra-healthy meals can be prepared in minutes, when we eat the HumanaNatura way and follow HumanaNatura’s OurPlate healthy eating guidelines. Our Salmon and Mango Salad Meal is a great example of modern natural eating, anytime and anytime of the year. Our featured HumanaNatura Salad Meal begins by steaming part of a salmon fillet – cut into bite-sized pieces and seasoned with red pepper, basil, and coriander – on top of a base of diced carrots, sweet potato, and onion, along with crushed and finely chopped garlic – all for about five minutes (see our Cooking With Steam Overview for guidance if you are new to food steaming). When done, the salmon and root vegetables are allowed to cool slightly (or are chilled, covered, for an hour or more, if the weather is especially warm). 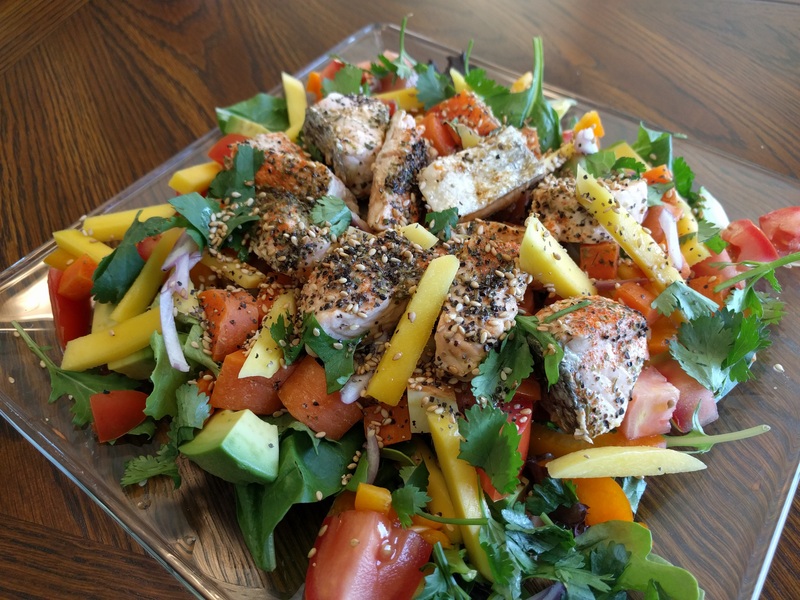 As the cooked salmon and vegetables cool, prepare of salad base of mixed greens, along with a veggie mix of diced tomatoes, cucumber, avocado, and bell pepper. Arrange the cooked chicken and root vegetables on top of the salad, and garnish it with slivered fresh mango, chopped cilantro, and a scattering of seeds or nuts. Dress and season the salad with herbs and black pepper to taste, and serve promptly. Tasty, healthy, and satisfying!